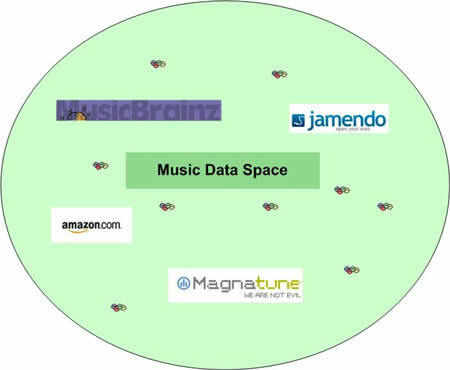 This is the Music Data Space. This Data Space contains information about musical things. These things are described mainly by using the Music Ontology, but also by using other ontologies like FOAF. Finally, things (musical things) belonging to this space are accessible, on the Web, via dereferencable URIs. So, the Music Data Space is a place where all musical things are defined on the Semantic Web, and accessible via the Web. That is it, and it is what we created last Monday. Now, some of you could wonder: why on earth Amazon.com belongs to the Music Data Space? Amazon.com also belongs to the Music Data Space too! Amazon.com live in the Music Data space too via their API. In fact, a simple experience with the OpenLink RDF Browser clearly demonstrates that Amazon.com’s data belongs to the Music Data Space too. Click on the link to Amazon. A window should popup. Select the Get Data Set (dereference) option. At this point, some magic will happens. In fact, the new information that is displayed in the RDF Browser is coming directly from Amazon.com’s web server. This is why I assume that Amazon.com belong to the Music Data Space too. In fact, the Virtuoso Sponger will connect to Amazon.com via their API to get some information about that album. It will convert the data into RDF and will display it to the user via the RDF browser’s interface. One step further: the JPG file also belongs to the Music Data Space! Click on the Image (JPG) representing the cover of this album. A window should popup. Select the Get Data Set (dereference) option. Check the triples that have been created from this image. The Virtuoso Sponger downloaded the JPG file, it analyzed its header, RDFized everything and sent the information back to the RDF Browser so that the user can see the information available for that image. Where is the end? I have no idea… probably at the same place where the imagination ends too. The Music Data Space is the starting point and many other type of data spaces should emerge soon. Can you explain a bit more? I don’t understand what makes one data space different from the next. If I can get to the URI for amazon.com (the company) within the music data space, then are books in the music data space? What’s the advantage of partitioning the Semantic Web in this way? To me it seems quite artificial. It’s almost like building new silos to replace the ones that we’re all trying to tear down! [quote post=”813″]This is the Music Data Space. This Data Space contains information about musical things. These things are described mainly by using the Music Ontology, but also by using other ontologies like FOAF. Finally, things (musical things) belonging to this space are accessible, on the Web, via dereferencable URIs. The only difference between a space and another space is the “domain” of the space: Music, Geographic Places, etc. The thing here is that one can access RDF infoformation about musical things, on the Web (via URI dereferencing). Also, these spaces (entry points to structured information about a subject (music)) are composed of many different sources of data (has sown by the schemas). Well, in some case, there can be intersections between Data Spaces. For example, we could create an intersection between the music data space and the geographical locations data spaces that would give a set of properties linking the two spaces. Such properties could be event:place like we have in that example. Well yeah, it could seems artificial. However, the goal is to create a conceptualization of the URIs space. Since about 1 year, people started to interlink data, create datasets, and now the goal is to make them available on the Web (presence on the Web of semantic web data via uri dereferencing). These Data Spaces is a conceptualization of this reality. In fact, the real goal is to help humans to understand this famous Semantic Web. In fact, my girlfriend doesn’t understand what is the Semantic Web. However, when I talk about a place where data about musical things can be accessed on the web, and that I show her that information via a RDF browser, and talk about future demos (from Yves Raimond) that will emerge from these “data spaces”, that, she understand. If my girlfriend that see the Web has a Web Browser and a way to connect to any Radios around the World, can understand this concept, will an investor too? Most than likely. Is Wikipedia (via dbpedia) going to be apart of the music dataspace? Well, this is a good question 🙂 In fact, Wikipedia could be see as a space in itself that describes types (subjects) of other data spaces. I would say that other data spaces would link to the wikipedia data space. But this is a little bit fuzzy, I agree. Check Yago (wikipedia wordnet) too.